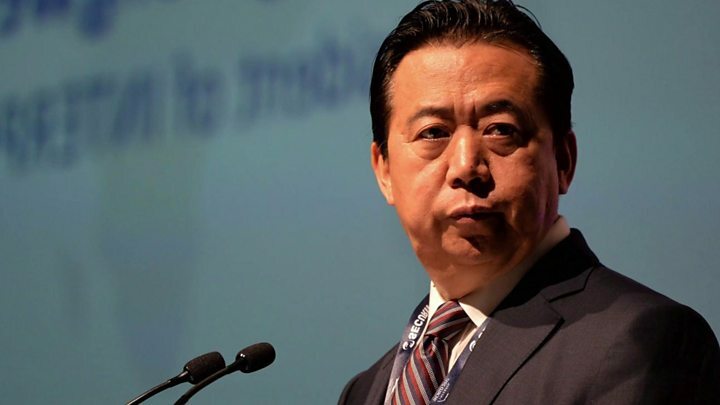 Meng Hongwei, the former Chinese head of Interpol, will be prosecuted in his home country for allegedly taking bribes, China's Communist Party says. He has also been expelled from the party and stripped of all government positions, according to the party's watchdog, the Central Commission for Discipline Inspection (CCDI). Mr Meng's disappearance in September prompted international concern. Mr Meng is said to have abused his position for personal gain, misusing state funds to finance his family's "extravagant lifestyle" and disregarding Communist Party principles. These charges amount to "serious violation of law and discipline", according to the CCDI, which said it had referred the case to state prosecutors. "Meng Hongwei has no party principles..." the party watchdog said. It added that his allegedly "illegal" income had been seized. Mr Meng is the latest Communist Party official to fall foul of Chinese President Xi Jinping's anti-corruption crackdown. Lu Wei, China's former head of internet censorship, was sentenced to 14 years in prison for bribery on Tuesday. Analysts believe President Xi's hard-line stance on corruption suggests he is manoeuvring to crush threats to his leadership. Mr Meng's wife Grace urged French President Emmanuel Macron to discuss her husband's detention during President Xi's visit to Paris this week. Last year, Mrs Meng told the BBC she was "not sure he's alive" after reporting him missing to French authorities. Since Mr Meng's disappearance on 25 September, no details have emerged about his prison conditions. He was one of six vice-ministers in China's public security ministry and had 40 years of experience in China's criminal justice system, so he has much knowledge about senior Communist Party officials. Interpol - the International Criminal Police Organisation - promotes co-operation and shares intelligence between police forces.